Mr. David Weislogel has earned the rank of 6th Degree Black Belt and Master Instructor. He began studying taekwondo in the early Spring of 2001 under Mr. David Perdue at Perdue’s Westerville Taekwondo after his oldest son had been involved in the program for a few months. 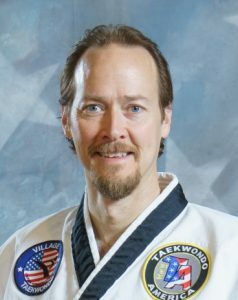 Mr. Weislogel became a Certified Instructor in Taekwondo America in February of 2003 and earned his National Instructor Certification in February of 2005. He was a volunteer instructor at the Westerville school for over 3 years teaching in children and adult classes before opening Hilliard Taekwondo with Ms. Thompson. After 6 years in Hilliard, Mr. Weislogel started teaching in Powell, OH when he opened Village Taekwondo in the spring of 2011. In addition to teaching, Mr. Weislogel continues to compete and place in national tournaments and trains regularly. Mr. Weislogel is frequently invited to area schools to do martial arts demonstrations and talk about ways to deal with bullies.